Monika sent me some FANTASTIC Swiss goodies to play with!! 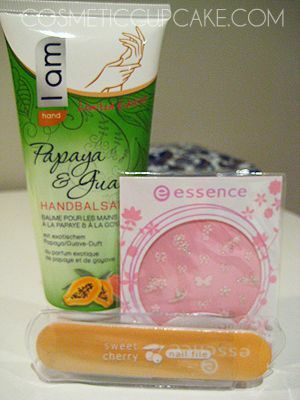 Here are some piccies of the fantastic polishes she sent my way! MNY polishes in 749, 657 and 109A. Monika tells me that MNY polishes are only available in Germany, Austria and Switzerland so how lucky am I that she grabbed some for me! =D The blue looks sooooo awesome! Essence Nail Art Twins in Carrie and Clyde, Essence Multi Dimension 3 in 1 polish in The One and Only and Essence Colour & Go polish in Check Me Out. 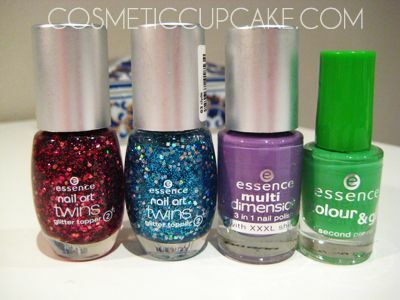 More Essence polishes to add to my collection yay! 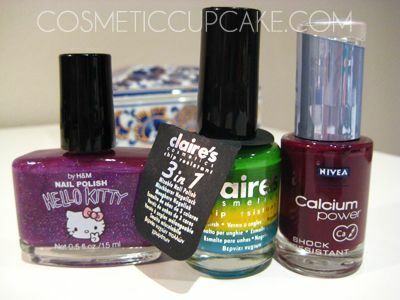 H & M Hello Kitty polish in Cool Summer, Claire's 3 in 1 Mixable polish and Nivea Calcium Power polish in Currant. I nearly died when I saw the H & M Hello Kitty!!! The Claire's 3 in 1 Mixable looks so interesting and am wondering how to use it properly.. does anyone have one and can share how to use it?? I also never knew Nivea made nail polishes but apparently they do in Europe! Monika did a great review of the colour Candyfloss here. 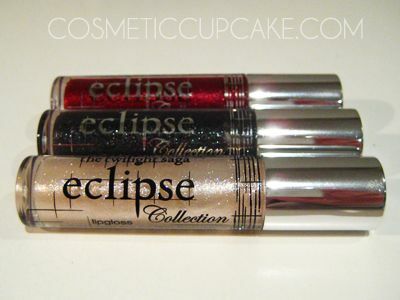 Essence Eclipse lipglosses in Lunch at Cullen's, Ready to be Bitten and Undead?. Monika very kindly hunted these down for me, thank you so much for fulfilling my lemming for them!! Thank you so much for this fantastic swap Monika! Please check out her blog Penguin Puranki and show her some support! She does great reviews on Japanese products and also does some lovely gel nail designs. The Hello Kitty polish looks so cute! Nice color too! Make sure you swatch the Claires mixable for us...am kinda intrigued how that's gonna turn out! wow!! they looks so good!! all from the polishes to the chocolate! and yes! please swatch the claires mixable! im so curious on how it'll turn out. :D great swap btw! not sure How to use the claire's myself, but I read somewhere it depends on how deep you dig in? hmm..
lovely swap!! 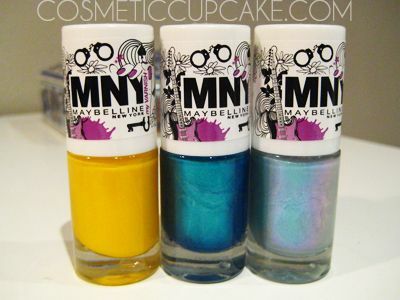 !those MNY polish colors looks pretty and :O i don't know that nivea actually has nail polish!!! omg this is such a great swap! i would love to such an international swap! so far mine have just been usa and canada! I'm impressed that the Claire's polish made the trip without getting all mixed together. As to how to use it, do not shake it or all the colors will mix together and you'll most likely end up with some murky, gross color. You're just supposed to brush it on with the 3 colors separated like that. Just a warning though, from the swatches I've seen, the marbling effect is very slim to none, so I've never been impressed enough to actually purchase one myself. Yummm i love lindt chocolate! I love that chocolate brand, Such a sweet swap! you have got to wear the HK polish first! I love having things from overseas that you cant get in Australia! P.S. 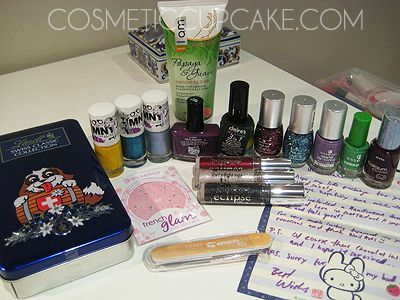 I just posted your giveaway package today...sorry for the delayy!! Its in a shoebox cos for some reason I could not find a single mailing box in my house! OMG! huuuge swap!! 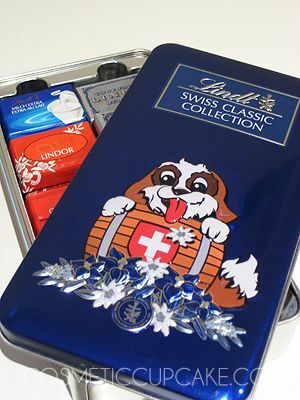 :) Lindt is the best!! Wow. Those MNY nps are just...wow. :D And yay, Lindt! What a generous blogger. Also, please tell me, I give up hunting, where do you get your Mode nps from? Like, the exact chemist? Because I really cannot find them but I really want to try them! Thanks. @Monika: I'll find out soon enough =) I swatched it on my nail wheel and it's mainly green with a few faint streaks of yellow. Once again thank you so much for the swap! @cupcakequeen22: Thank you for the info about the Claire's 3 in 1! I did do a quick swatch on a nail wheel and yeah, the effect is not very noticeable. But it's still very cool! @Katrina: It's such a lovely blue polish. Monika did a great job picking colours for me! @Alice: It was an awesome swap! Lindt is sooooo yummy. Hmmm, that Claire's 3 in 1 is really tempting! Also, as you can probably see, I just found your blog. I'm loving it!